There’s nothing like the death of your teenage hero to halt you in your tracks. The moment I heard the news of David Bowie’s death, I was instantly transported back to hormone-fuelled teenage dorm rooms; a vivid picture of my friends and I hollering “Lets Dance!” at the top of our lungs. My oft-kissed, most beloved possession – a life-sized poster of Bowie – flashed before my eyes, along with my first ‘pash’ and a myriad of other angst-filled boarding school memories. As I considered how long ago those memories actually were, David’s death brought me face-to-face with my own mortality. In the scheme of humanity, Bowie was here for a nanosecond. But the immense and kaleidoscopic impact he left – on the cultural, musical, fashion and art scenes of our time – is irrefutable. Bowie didn’t resist change; he welcomed it with open arms. Bowie reinvented himself constantly. His chameleon-like approach to every creative project he took on was breathtaking. It would have been so easy to sit back, rest on his laurels and cash in on each successful exploit. But his infamous move of killing off Ziggy Stardust at the height of his fame was just one demonstration of his willingness to reinvent himself and move onto the next creative adventure. He was a poster child for collaboration. From Queen to Mick Jagger to Lou Reed and a multitude of other artists, Bowie saw the collaborative approach as a sure vehicle to creative greatness. Collaboration is the way of success in this century. Bowie was ahead of his time in realising its potential. Collaboration is the way of success this century. Bowie realised its potential. He was unabashedly, uncompromisingly himself. 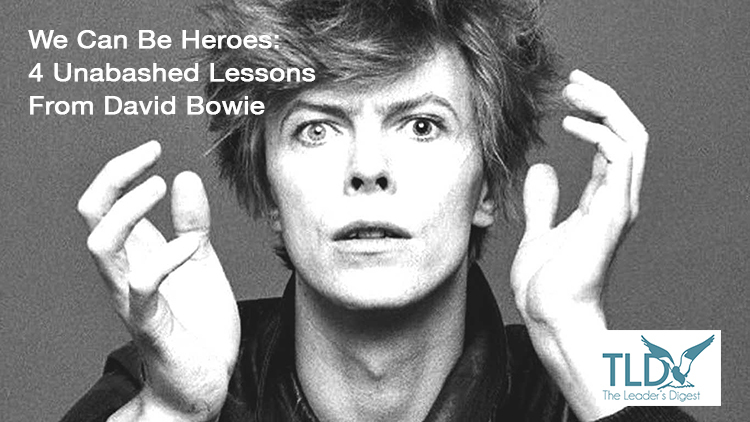 Bowie epitomised a life lived authentically. He marched to the beat of his own drum, regardless of the flack it sometimes elicited. He wrote and performed what he wanted, never bowing to the pressures to be a fake version of himself. Even his last creative exploit, Lazarus, a parting gift to his fans, was delivered on his terms. He was curious and inquisitive. About life and himself. He used his pervasive feelings of fear, isolation, abandonment and anxiety as creative vehicles to explore the world around him. So, thank you, David Bowie. For the wonderful walk down memory lane to my teenage self. For reminding us that We Can Be Heroes. That we too can live an authentic, creative, flamboyant life if we choose to. Nice one Suzi, yes the immensity of his catalogue is hard to appreciate. Having had a full day now listening to Bowie through the ages, you almost have to shake your head. Ahead of the curve in so many ways. Bowie was also an enthusiastic adopter of new technologies – Richard Branson recalls his involvement in the music industry’s move to digital downloads in his blog – http://bit.ly/1JGRAYr.